Friday & Saturday nights starting in May, bring friends & family to Dog Haus Biergarten for FREE movie screenings in the Richardson Restaurant Park plaza! Check back here soon for our movie screening schedule! Your search for the best brews around just got easier. 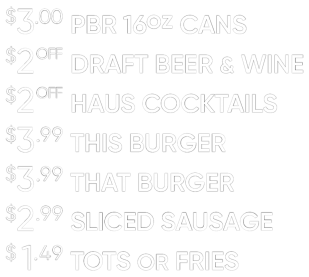 Our craft-casual gourmet hot dogs, sausages and burgers; premium shakes and soft-serve ice cream; and beer program that spotlights local brews has garnered critical acclaim and national attention since we opened our first location in our hometown of Pasadena, CA in 2010. We’re known for signature all beef Haus Dogs and hand crafted proprietary Haus sausages as well as the 100% genetically tested, humanely raised Black Angus beef using no hormones and no antibiotics - never ever. Another reason dogs, sausages and burgers are special is that we serve them on grilled King's Hawaiian rolls. 10 OUT OF 10, WOULD EAT AGAIN! LISTED AS ONE OF THE "BEST HOT DOGS IN AMERICA"
TOP 5 PLACES TO EAT A HOT DOG IN THE U.S.
AMERICA’S 20 BEST HOT DOGS "SOOO CALI DOG"
Partner with the Absolute Würst Franchise. Prime territories are moving fast.